Microsoft Word is undoubtedly one of the best text editors that is used by millions of users across the globe. Whether it’s a letter, an article or anything that needs to be written, simply launch MS word and start typing. It’s easy to use interface with diversified control options making it a unanimous application of choice, especially for the bloggers. But have you guys ever been in a situation when you just closed the document without saving it? Yeah, it provides a warning as a dialogue box in case you are trying to close the document before saving. But in a fit of hurry, it can happen that you may have ignored that warning as well. Also, sudden power failure or crash of MS Word application can also send you into a frenzy where your unsaved progress could get lost. Does this mean that in any case if you close MS Word without saving, then it is all gone and there’s no way to get that unsaved document back? Thankfully, The answer is a positive one, and you can recover unsaved changes. It seems that Microsoft also knows that it might be a case that a user may close MS Word before saving the document. Therefore, by default MS Word automatically saves the document in a temporary file. Although this feature is enabled by default but you can also confirm it. To confirm click on File > Options. In the new window that opens click on Save option. Now make sure that the option, “Keep the last AutoRecovered version if I close without saving” is checked marked. Bonus Tip: We also recommend making sure to check mark the option, “Save AutoRecover information” and set the time to minimum i.e. 1 minute. Please be warned that only if “Keep the last AutoRecover version if I close without saving” is checked marked, can you recover an unsaved document. Since we consider that you have this option enabled, open MS Word by double clicking on its icon. Once you have opened MS Word click on File option located at upper-left corner of the screen. In the new window that opens click on Info. Now in the right pane click on Manage Document > Recover Unsaved Documents. Once you click on Recover Unsaved Documents, it will open a new window containing that unsaved document with file type ASD, along with the date and size. Click on that file and select Open. This will open your unsaved document. Now click on Save As button to save the document. That’s it. So, guys, now you do not need to worry in case you forget to save the document before closing MS Word. 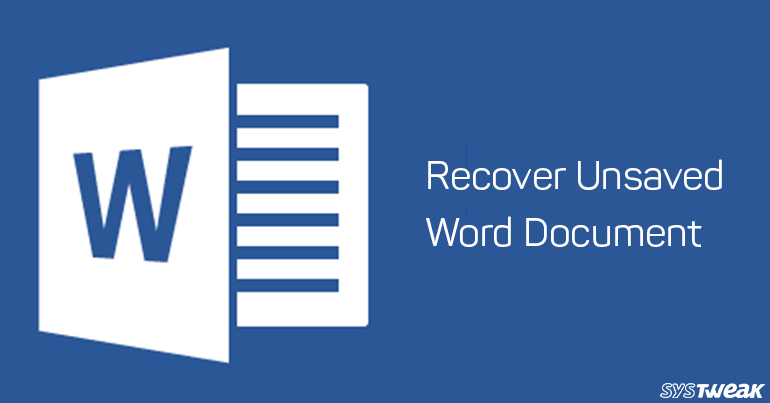 As you can now easily recover that unsaved Word document. Still any queries feel free to share them in the comment box below.